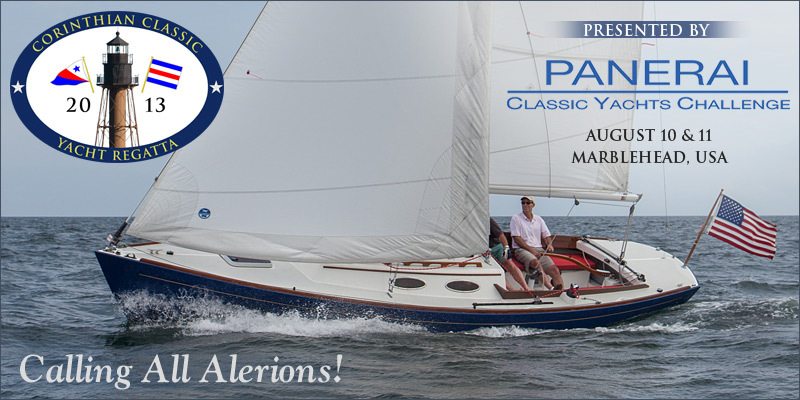 The Alerion class is one of the most beautiful "Spirit of Tradition" yachts out cruising and racing the waters today and there really isn't a more exciting and just plain fun regatta to be a part of than the Corinthian Classic Yacht Regatta, August 10th & 11th. This is a rare opportunity for Alerion owners to gather and sail your boats in a Corinthian spirit. We now have an addition to the Alerion Express entries as George Spieker will be bringing "Airtha" down from New Hampshire. We've got DeWitt Brown aboard "Lumen Solare" and Mark King aboard his "Pastis". What do you say about giving them a run for their money? We're waiting for the 33's and 38's, so come on, let's make an event of this, shall we? A good regatta happens on and off the water and you can expect that the Corinthian Yacht Club along with Panerai will put on a good show. There will be a cocktail reception during registration Friday evening; cocktails, dinner, presentations and featured Honoree James "Sham" Hunt, Saturday evening, and of course, more beverages and trophies after racing Sunday.